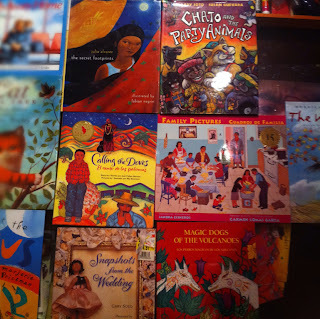 When earlier last month Lee & Low Books posted this question in their blog, "Why Hasn’t the Number of Multicultural Books Increased In Eighteen Years?" many responses began circulating that touched everything from how we feel about white authors and illustrators writing books about people of other races, and about the role (and the criteria to select winners) of ethic book awards such as the Coretta Scott King Award or the Pura Belpre or the Asian Pacific American Book Award and many others, as well as about the need for books that represent other cultures while still been fun rather than focusing on historical periods of a people, and much more. Roger Sutton posted his two own answers--as he describe them--one only semi-facetious and one perhaps semi-impolitic. I hope that most everybody could be part of this conversation. As we continue talking about multicultural book, the publishing industry, and the demands of the readers continues, I only hope that 1) We can move into creating significant lasting changes, and 2) that we do it while still honoring what award committees, publishers, librarians, booksellers, and even authors and illustrators have been doing to this day to have a more diverse and inclusive children's literature.